Author contributions: Tack GJ and van de Water JMW contributed equally to this work; Tack GJ and van de Water JMW performed the research; Tack GJ, Kooy-Winkelaar EMC, van Bergen J, Bonnet P, Vreugdenhil ACE, Korponay-Szabo I, von Blomberg BME, and Schreurs MWJ contributed to measurements or analyses of the data; Edens L contributed to development of the enzyme; and Bruins MJ, Mulder CJ and Koning F contributed to writing of the manuscript; Tack GJ and van de Water JM contributed equally. AIM: To assesses the safety and efficacy of Aspergillus niger prolyl endoprotease (AN-PEP) to mitigate the immunogenic effects of gluten in celiac patients. METHODS: Patients with initial diagnosis of celiac disease as confirmed by positive serology with subtotal or total villous atrophy on duodenal biopsies who adhere to a strict gluten-free diet (GFD) resulting in normalised antibodies and mucosal healing classified as Marsh 0 or I were included. In a randomised double-blind placebo-controlled pilot study, patients consumed toast (approximately 7 g/d gluten) with AN-PEP for 2 wk (safety phase). After a 2-wk washout period with adherence of the usual GFD, 14 patients were randomised to gluten intake with either AN-PEP or placebo for 2 wk (efficacy phase). Measurements at baseline included complaints, quality-of-life, serum antibodies, immunophenotyping of T-cells and duodenal mucosa immunohistology. Furthermore, serum and quality of life questionnaires were collected during and after the safety, washout and efficacy phase. Duodenal biopsies were collected after the safety phase and after the efficacy phase. A change in histological evaluation according to the modified Marsh classification was the primary endpoint. RESULTS: In total, 16 adults were enrolled in the study. No serious adverse events occurred during the trial and no patients withdrew during the trial. The mean score for the gastrointestinal subcategory of the celiac disease quality (CDQ) was relatively high throughout the study, indicating that AN-PEP was well tolerated. In the efficacy phase, the CDQ scores of patients consuming gluten with placebo or gluten with AN-PEP did not significantly deteriorate and moreover no differences between the groups were observed. During the efficacy phase, neither the placebo nor the AN-PEP group developed significant antibody titers. The IgA-EM concentrations remained negative in both groups. Two patients were excluded from entering the efficacy phase as their mucosa showed an increase of two Marsh steps after the safety phase, yet with undetectable serum antibodies, while 14 patients were considered histologically stable on gluten with AN-PEP. Also after the efficacy phase, no significant deterioration was observed regarding immunohistological and flow cytometric evaluation in the group consuming placebo compared to the group receiving AN-PEP. Furthermore, IgA-tTG deposit staining increased after 2 wk of gluten compared to baseline in four out of seven patients on placebo. In the seven patients receiving AN-PEP, one patient showed increased and one showed decreased IgA-tTG deposits. CONCLUSION: AN-PEP appears to be well tolerated. However, the primary endpoint was not met due to lack of clinical deterioration upon placebo, impeding an effect of AN-PEP. Celiac disease (CD) is a major health care issue affecting people of all ages, with a worldwide prevalence of approximately 1%. This immune-mediated small intestinal enteropathy is triggered by gluten proteins derived from wheat, barley and rye. Celiac disease is characterised by an inflammatory immune response, resulting in small-intestinal mucosal injury and malabsorption in genetically susceptible individuals. Currently, the only safe and effective treatment is a strict gluten-free diet (GFD) combined with nutritional support, which improves the health and quality of life in the vast majority of patients. However, a GFD is perceived as a substantial burden, particularly due to high costs, dietary restriction, reduced social activity, and increased health worries. Gluten proteins are highly abundant in proline (15%) and glutamine (35%) residues, particularly in those regions identified as immunogenic in CD. The proline- and glutamine-rich peptides in gluten are relatively resistant to proteolysis by gastric, pancreatic and intestinal enzymes[6,7]. Consequently, digestion-resistant proline- and glutamine-rich peptides can reach the intestinal epithelium intact and can trigger an immune response that eventually results in mucosal damage. To eliminate such proline-rich gluten peptides, prolyl oligopeptidases, enzymes that can cleave after a proline residue in peptides, have been investigated by Shan and colleagues. Such enzymes, derived from bacteria like Flavobacterium meningoseptum, Sphingomonas capsulate and Myxococcus xanthus, were capable of breaking down toxic gluten in vitro[6,8,9]. These prolyl oligopeptidases are however not stable and functional under acidic conditions of the stomach[9,10] and are unlikely to degrade gluten epitopes before they reach the small intestine. Alternative enzymes that can break down gluten are derived from germinating barley and the fungus Aspergillus niger. From the latter a prolyl endoprotease termed Aspergillus niger-derived prolyl endoprotease (AN-PEP) is derived which has distinct advantages over the bacterial prolyl oligopeptidase as it degrades both whole gluten and gluten peptides into non-immunogenic residues within minutes[11,12]. Moreover, the enzyme is active between pH 2 and pH 8, with an optimum activity at pH 4-5, and is therefore effective at the pH levels present in the stomach and beyond[11,13]. Importantly, the enzyme is not degraded by pepsin in the stomach and thus remains fully functional. Mitea et al extended these findings by showing that AN-PEP degraded toxic gluten proteins in a food matrix into non-immunogenic gluten fragments in an in vitro digestion model that simulates the human gastrointestinal tract. After these promising in vitro results, it remains to be established in CD patients whether AN-PEP can reduce the clinical response to gluten. The aim of this two-phase proof of concept study was to demonstrate the safety of AN-PEP in the first phase and the ability of ANPEP to reduce antibody and histological response to gluten consumption by CD patients in the second phase of the study. This information will be important to further develop AN-PEP as a future digestive aid for unintentional ingestion of gluten by CD patients. Sixteen adults with CD were recruited at the outpatient clinic of the department of Gastroenterology and Hepatology of the VU Medical Centre Amsterdam, The Netherlands. Inclusion criteria were an initial diagnosis of CD as confirmed by histological abnormalities on duodenal biopsies classified as a Marsh IIIB or IIIC lesion and supported by positive serology; endomysium IgA antibodies (IgA-EM) and/or tissue transglutaminase IgA antibodies (IgA-tTG). Patients were required to have well-controlled CD as evidenced by Marsh 0 or I, and normalised IgA-EM and IgA-tTG on a strict GFD for at least one year. Women at fertile age were required to take adequate contraception measures. Reasons for exclusion were: use of any anticoagulant or immunoregulatory drug within the last 6 mo; clinically suspected bleeding tendency; pregnancy or breast feeding; presence of any concurrent active infection; and IgA deficiency. The intervention was performed between May 2008 and April 2009. The intervention consisted of two periods, each lasting 2 wk (Figure 1). The first study phase was an open-label period designed to assess the safety of high gluten intake with AN-PEP (safety phase). The second phase was a randomised, double-blind, placebo-controlled parallel-group study to assess the effect of AN-PEP on gluten-induced clinical response (efficacy phase). Sixteen patients with diagnosed CD were enrolled in the safety phase. Patients were asked to consume five pieces of toast (in total approximately 7 g gluten, Bolletje®, The Netherlands) with AN-PEP-containing topping daily in the morning for 2 wk. Patients were allowed to consume a glass of water (250 mL) with their toast. They were asked to continue their usual GFD. For ethical reasons, patients deteriorating ≥ 2 scales on the histological Marsh classification during this safety phase were not included in the efficacy phase. Between the study phases, a 2-wk washout period was introduced in which patients continued their usual GFD. Subsequently, fourteen patients were randomised in a 1:1 ratio in blocks of four in a double-blind fashion to the same amount of toast with AN-PEP-containing topping (n = 7) or placebo topping (n = 7) for 2 wk while remaining on their usual GFD. Patients’ compliance with the product intake was checked by regular telephone contact. Figure 1 Study design and flowchart. In the safety phase, 16 patients daily consumed 5 pieces of toast with Aspergillus niger prolyl endoprotease (AN-PEP) for 2 wk while continuing their gluten-free diet (GFD). Two patients deteriorated on Marsh scores and were excluded. After a 2-wk wash-out period during which the patients continued their usual GFD, the remainder of 14 patients were randomized to the efficacy phase to receive 2 wk of toast with either AN-PEP or placebo while continuing their GFD. CDQ: Celiac disease quality. Before and during the study phases, the patients visited the outpatient clinic five times (Figure 1). During the safety phase, blood was collected one week before (baseline), and one and two wk after start of gluten with AN-PEP consumption. During the efficacy phase, blood was collected at one and two wk after start of gluten with AN-PEP or placebo consumption. Duodenal biopsies were taken at baseline and at the end of the safety phase and the end of the efficacy phase. Both in the safety and efficacy phase, participants were asked to complete a celiac disease-specific health-related quality of life questionnaire for adults at baseline and after two wk of intervention. Biopsies and blood sampled at the end of the safety phase were used as baseline values to limit the burden for the patients. The AN-PEP and placebo topping were prepared by DSM Food Specialties, Delft, The Netherlands. Both toppings (18.5 g) contained 8.2 wt% sucrose, 8.2 wt% saccharine solution (400 mg/L saccharine plus 4000 mg/L cyclamate), 0.4 wt% citric acid (Jungbunzlauer, Basel, Switzerland), 0.08 wt% potassium sorbate (Interland Chemie, Oosterhout, The Netherlands), 0.31 wt% sodium benzoate (Prolabo, Leuven, Belgium), and 1.23 wt% xanthane gum Keltrol RD (CP Kelcko, Nijmegen, The Netherlands). The AN-PEP topping contained 81.5 wt% AN-PEP enzyme concentrate corresponding with 168 Proline Protease Units of enzyme activity. The placebo topping contained 81.5 wt% distilled water with 0.06 wt% Plantex® MDA31 (colouring agent, DSM Food Specialties, Delft, The Netherlands) to match for colour differences. The aroma, flavour and consistency of the topping with AN-PEP were identical to those with placebo and both toppings could not be distinguished. Microbial counts and enzyme activity of the AN-PEP and placebo toppings were analysed monthly. All microbial counts remained below 10 CFU/g and the activity of the enzyme was maintained at 9.1 ± 0.3 PPU/g topping during 12 mo shelf life at 4 °C. The AN-PEP and placebo toppings were identical in taste and appearance. They were pre-packed in containers (14 per box) by DSM and consecutively numbered for each patient according to the randomisation schedule (prepared by the DSM statistician). Each patient was assigned a random order number and received from the physician the containers in the corresponding non-transparent pre-packed box. The allocation sequence was concealed from the researcher enrolling and assessing participants in sequentially numbered sealed non-transparent envelopes. Envelopes were opened only after completion of the trial and assessments. All patients, investigators, care providers, and staff assessing outcomes were kept blind to treatment assignment. Mucosal biopsy immunohistology and immunophenotyping of lymphocytes, and serum antibodies were measured in the service laboratories of the VU University Medical Centre (Amsterdam, The Netherlands). Mucosal biopsy gluten-specific T-cell lines were measured in the research laboratory of the Leiden University Medical Centre (Leiden, The Netherlands). Mucosal biopsy IgA-tTG deposits were analysed at the University of Debrecen (Hungary). Adverse event reporting: Tolerability of the gluten intake with AN-PEP or placebo was assessed by adverse event reporting to the physician during visits. All complaints were documented throughout the study. The study design did not allow for differentiation between complaints resulting from gluten or treatment. A difference in complaints between the AN-PEP and placebo group during the efficacy phase may give an indication of treatment-related effects. Celiac-disease quality of life: All participants were asked to complete at home the CD quality of life questionnaire, which was translated into Dutch. The CD quality of life questionnaire included four disease-specific and health-related categories (emotional problems, social problems, disease-related worries, and gastrointestinal symptoms) with 7 items each. Each question was weighed on a scale of 1-7 points, a high score corresponding to a high level of well-being. In total 196 points could be obtained, with a maximum of 49 points for each separate category. A change of 12 or more points on the total score or of 3 or more on the different categories was considered a clinically relevant change. Mucosal biopsy immunohistology: Twelve duodenal mucosal spike biopsies were taken through upper gastro-intestinal endoscopy. 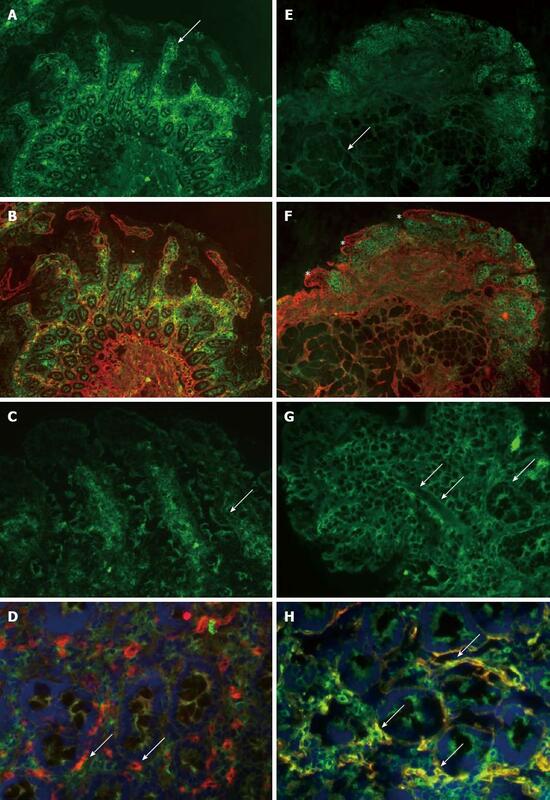 Four paraffin-embedded biopsies were sectioned and hematoxylin-eosin-stained for histological evaluation according to the modified Marsh classification. At least two grades increase in the Marsh scale was considered a clinically significant deterioration. Six fresh biopsies were used for flow cytometric analysis and two were snap frozen in liquid nitrogen and stored. Mucosal biopsy immunophenotyping of lymphocytes: Multiparameter flow cytometric immunophenotyping of mucosal intraepithelial and lamina propria lymphocytes was performed. These lymphocytes were isolated from six duodenal biopsy specimens per time point through chemical and enzymatic dissociation. The cells were stained with fluorescein isothiocyanate, phycoerythrin, peridinin chlorophyll protein and allophycocyanin-labelled monoclonal antibodies directed against CD3, CD4, CD8, CD16/56, CD19, CD45, CD45RA, HLA-DR, NKG2D, CD25 and TCR gamma-delta (all from BD Biosciences, San Jose, CA, United States), and appropriate isotype controls were included. Stained cells were analysed on a 4-colour flow cytometer (FACSCaliburTM, BD Biosciences) and the data were analysed using CellquestTM software (Becton Dickinson, San Jose, CA, United States). Care was taken to analyse only viable cellular events based on light scatter properties. The mean fluorescence intensity index as compared to isotype controls was calculated for the markers included. Mucosal biopsy gluten-specific T-cell lines: Gut-resident, gluten-reactive T-cells are a hallmark of CD. To demonstrate that all patients possessed such cells, polyclonal T-cell lines were generated from small intestinal biopsies as described. The resulting T-cell lines were tested for reactivity against a pepsin/trypsin digest of gluten and a pepsin/trypsin digest of gluten that had been treated with tissue transglutaminase in a T-cell proliferation assay as described. In all patients gluten reactivity could be demonstrated (not shown). Mucosal biopsy IgA-tTG deposits: Biopsies at the end of the randomisation study phase were stained for tTG-related extracellular IgA deposits and, in case of positivity, baseline biopsies were stained as well. Twelve unfixed, 5 μm-thick frozen sections were examined per patient by double immunofluorescent labelling of IgA (green) and tTG (red) as previously described. IgA is normally detected only inside plasma cells and at the luminal surface, whereas in active CD, subepithelial deposits composed of IgA-tTG are found along the surface and crypt basement membranes and around mucosal vessels, corresponding to the intestinal localisation of tTG. The CD-type IgA-tTG deposits were graded from 0 to 3 according to their intensity along the basement membranes in the villous-crypt area. As this study of the small intestinal IgA-tTG deposits is highly subjective, it was performed by an independent specialist in this field in a blind manner to greatly increase its accuracy. Serum antibodies: Blood samples were collected by venipuncture to analyse CD-associated antibodies. Levels of IgA-tTG, gliadin IgA antibodies (IgA-AG) and gliadin IgG antibodies (IgG-AG) were determined with a standard in house enzyme-linked immunosorbent assay (ELISA), using recombinant human tissue transglutaminase (Diarect AG, Freiburg, Germany) and gliadin extract (Sigma-Aldrich, Zwijndrecht, the Netherlands) as substrates, respectively. IgA-EM antibodies were determined by an in-house indirect immunofluorescence test according to Lerner using monkey oesophagus as substrate. IgA deficiency was excluded to avoid false negative serology. In addition, in retrospect a combined test for IgA and IgG antibodies directed against human tissue transglutaminase and deamidated gliadin-derived peptides (IgA/G-DGP-tTG; tTG/DGP Screen ELISA, INOVA Diagnostics, San Diego, United States) was performed. References values for antibodies were categorized into negative, dubious, weak positive, positive, and strong positive. Reference ranges for IgA-AG were < 2.4, 2.5-3.9, 4.0-20, 20-80, and > 81 U/mL, for IgG-AG, < 11, 12-20, 21-40, 41-100 U/mL, for IgA-tTG, < 2.9, 3.0-5.9, 6.0-20, 21-50, > 51 U/mL, and for IgA/G-DGP < 6.9, 7.0-10.9, 11-30, 31-100 and > 100 U/mL respectively. The study was approved by the Medical Ethics Committee of the VU Medical Centre and conducted in accordance with the guidelines of the Declaration of Helsinki. The trial has been registered in the Dutch Trial register (NTR1281) and the FDA Clinical Trial register (NCT00810654). A written informed consent was obtained from each subject before enrolment. Data were analysed by OCS Biometric Support (Leiden, The Netherlands). Difference from baseline in mucosal immunohistology between the two groups after 2 wk as measured by Marsh classification was considered the primary outcome measure. All other parameters were considered secondary endpoints. Power analysis revealed that for the detection of a two-grade difference in the Marsh score with a power of 0.80 and a one-sided α level of 0.05, 14 patients were needed to finalise the study. Data were analysed in the SAS version 9.1, using both parametric and non-parametric tests depending on the nature of the data. The quality of life data were analysed with paired t tests to test for differences between data before and after the 1st (safety) and 3rd (efficacy) period of the study. Serological and histopathological outcome parameters were analysed with Wilcoxon signed-rank tests to determine differences between data before and after the 1st period and the Wilcoxon rank sum tests to test the treatment differences in change from baseline in the 3rd period of the study. In order to explore whether patients’ baseline characteristics would predict their response to gluten (and hence to increase the chances of success in a future trial), rank correlations between baseline characteristics and outcome variables were explored in the placebo group using the Spearman Rank Correlation Coefficient (r) of the ranked data (analysed by DSM statistician). The demographic and baseline characteristics of the patients are presented in Table 1. In total, 16 adults on a gluten-free diet diagnosed as having CD [median age: 55 (20-68) years] were enrolled in the study. The demographic characteristics of both treatment groups were comparable with exception of the median age at diagnosis of CD, which was 20 years higher in the AN-PEP compared to the placebo group. The median time on GFD treatment was similar in both groups. Two patients were excluded after the safety phase because of a histological deterioration of two and three Marsh grades, respectively, which for one patient returned to normal (Marsh 0) after four weeks of exclusion. The patient that did not return to normal started the study with high IgA/G-DGP-tTG values. However, other CD-related antibodies remained undetectable in these two patients. The remaining 14 patients entered and completed the efficacy phase. Table 1 Demographic and baseline characteristics of the safety and efficacy phase. GFD: Gluten-free diet; AN-PEP: Aspergillus niger prolyl endoprotease. When correlating the patients’ baseline characteristics with their response to gluten, highly significant inverse relationships were found between the patients’ time since diagnosis or time spent on a GFD and their response to gluten as measured by IgG-AG, IgA-tTG and IgA/G-DGP-tTG, and Marsh scores (data not shown). No serious adverse events occurred during the trial, patients reported no severe adverse events, and no patients withdrew during the trial. Complaints that were reported during the safety and efficacy phase were of gastrointestinal nature and mostly mild and transient. The number of reported gastrointestinal complaints did not differ between the AN-PEP and placebo group (Table 1). The mean total scores of the four categories on the CD quality of life were relatively high (145-156 out of a total score of 196) in the total group and throughout both study phases. In the safety phase, the total CD quality of life score significantly (P = 0.04) increased by 6 points during gluten with AN-PEP treatment. This increase was however lower than the 12-point increase that is considered a clinically relevant quality of life improvement. In the efficacy phase, the individual or total CD quality of life scores of patients consuming gluten with placebo or gluten with AN-PEP did not significantly deteriorate. No differences between the groups were observed. The mean score for the gastrointestinal CD quality of life was relatively high throughout the study, indicating that gluten with AN-PEP was well tolerated. In the patients receiving gluten plus AN-PEP treatment in the safety phase, several patients showed variation in Marsh scores but overall no significant change in degree of mucosal damage, as indicated by changes in the Marsh score, was observed (Table 2). Two of 16 patients were excluded from entering the efficacy phase as their mucosa showed an increase of two Marsh steps while 14 patients were considered histologically stable on gluten with AN-PEP. Also after the efficacy phase, no significant deterioration was observed in the group consuming gluten with placebo compared to the group receiving AN-PEP. Table 2 Serum antibodies, duodenal immunohistology and tTGA-A antibody deposits in the safety and efficacy phase for all patients. The serum EMA-A antibodies remained negative in all patients during the entire study. Mucosal tTGA-A deposits were graded from 0 to 3. Tx: Treatment; A: AN-PEP; P: Placebo; E: Excluded; IgA-tTG: Anti-tissue transglutaminase IgA antibodies; IgA-GA: Anti-gliadin IgA antibodies; IgG-GA: Anti-gliadin IgG antibodies; IgA/G-DGP-tTG: Anti-tissue transglutaminase and deamidated gliadin-derived peptide IgA and IgG antibodies; I-FABP: Intestinal fatty acid binding protein; ND: Not determined. -: Negative; +/-: Dubious; +: Weak positive; ++: Positive; +++: Strong positive. Flow cytometric analysis of intestinal lymphocyte subsets showed no significant changes in the expression of the T-cell lineage associated markers CD3, CD4, CD8 and TCR γδ, in either the intraepithelial lymphocyte or the lamina propria lymphocyte populations of both treatment groups during the efficacy phase. The mean fluorescence index of the activation markers CD25, HLA-DR, the NK receptor and NKG2D as well as CD45RA, a marker for naïve T-cells, showed no significant change in either group. Mucosal tTG-related extracellular IgA deposits are hypothesised to be an early marker for CD activity. Despite a GFD, two of seven patients started with positive staining for IgA-tTG at baseline (Table 2). Compared to baseline, IgA-tTG deposit staining increased after 2 wk of gluten intake in four out of seven patients on placebo. In the seven patients receiving AN-PEP, one patient showed increased and one showed decreased IgA-tTG deposits (Table 2, Figure 2). Figure 2 Small intestinal tissue transglutaminase IgA antibody deposits (rated on a scale 0-3) in two patients at baseline and after randomization to Aspergillus niger prolyl endoprotease and placebo respectively. A: Baseline evaluation of patient 1 showed preserved villous architecture (arrow), with intense, grade 3 IgA depositions (green) subepithelially and around crypts; B: This deposition merges to yellow indicating co-localisation with tTG shown in red; C: In this patient, IgA deposits diminished after 2 wk Aspergillus niger prolyl endoprotease (AN-PEP) treatment to grade 1, when only faint and patchy antibody deposition was seen (arrow); D: tTG appeared in red in this AN-PEP-treated patient (arrow) in the absence of IgA deposition. The cell nuclei were stained with 4',6-diamidino-2-phenylindole (DAPI) (blue); E: Baseline evaluation of patient 2 showed preserved villous architecture with faint, grade 1 IgA deposition in the deep mucosal layer around Brunner glands (arrow); F: This deposition were not sufficient to obtain a yellow colour at merging with tTG shown in red (asterisk); G: In this patient, IgA deposition increased to grade 2 subepithelially (arrow) after 2 wk placebo; H: IgA deposition increased to grade 3 in the crypt region after 2-wk placebo (arrow). IgA deposition co-localised with tTG to intense yellow (arrow). The cell nuclei were stained with DAPI (blue). Serum CD-associated antibodies (IgA-tTG, IgA-EM, IgA-AG, IgG-AG and IgA/G-DGP-tTG) were not detectable in the serum of enrolled patients at baseline (Table 2) except for one patient in which borderline levels of IgA/G-DGP-tTG were detected, which became negative after 2 wk of gluten with AN-PEP consumption. The IgA-tTG, IgG-AG, IgA/G-DGP-tTG, and IgA-EM antibody titers remained negative on gluten with AN-PEP. Three out of sixteen patients developed detectable or borderline IgA-AG levels, while 13 patients remained negative during 2-wk of gluten with AN-PEP (Table 2). During the efficacy phase, neither the placebo nor the AN-PEP group developed significant antibody titers (Table 2). The median antibody titers after 2 wk gluten intake did not significantly differ between AN-PEP and placebo treatment. The IgA-EM concentrations remained negative in both groups. The enzyme AN-PEP might possibly assist in digesting unintentionally ingested amounts of gluten in those who cannot tolerate gluten. However, demonstrating a treatment effect on (small) clinical deterioration induced by small amounts of gluten in the placebo group may be difficult. Therefore, in this proof of principle study, the enzyme was given to patients consuming large amounts of gluten in a relative small period of time. A two-week safety phase (AN-PEP + gluten) preceded the randomization for AN-PEP or placebo as requested by the medical ethical commission due to concerns about such a high dose of gluten consumption. Unfortunately, the primary aim of the study was not met as the placebo arm did not show any deterioration after 2 wk of gluten consumption. With hindsight, the study should possibly have been designed for a much longer period of time with many more patients. The baseline characteristics were balanced between groups except for median age at diagnosis, which was 20 years higher in the AN-PEP compared to the placebo group. However, this is unlikely to have influenced the study outcome as no relationship between the age of diagnosis and the response to gluten was observed (data not shown). The safety phase showed that AN-PEP treatment, when consumed with a high dose of about 7 g of gluten for 2 wk, was safe in patients and no severe adverse events were reported. The CD quality of life scores remained relatively high during 2 wk consumption of gluten and AN-PEP indicating that patients’ general well-being remained high. Serum antibodies of the sixteen patients did not increase when consuming AN-PEP with 7 g of gluten for 2 wk. Also, histology of the biopsies of the majority of patients (fourteen) showed no deterioration while two patients developed increased Marsh scores, however not accompanied by increased antibodies. The safety phase was subject to a so-called “ceiling effect” because patients entered the study on a GFD reflecting relatively healthy baseline values, limiting the ability to demonstrate any further improvement by AN-PEP. Patients in the placebo group did not show significant deterioration on any of the measured clinical variables after a 2-wk gluten challenge, indicating that 2 wk of gluten challenge is insufficient to induce a clear clinical response in this population of celiac patients. Due to lack of response to gluten in the placebo arm, no treatment effect of AN-PEP could be detected. The measured serum levels of IgA-tTG, IgA-EM, and IgA/G-DGP-tTG antibodies are considered sensitive markers of CD and should be able to detect subtle immunogenic effects of gluten. Similarly, the CD-specific quality of life questionnaire is considered a CD-specific measure of quality of life and should also be able to pick up relevant changes in health. However, histological examination of small intestinal biopsies may be less reliable than CD-associated antibodies due to heterogeneous distribution of lesions, low grade histopathology, and intra- and interobserver variability. Interestingly, measures of clinical response to gluten (Marsh scores, antibody titres, quality of life scores) did not correlate in this study, which may in part be explained by the lack of response to gluten. The IgA antibody reactivity to small intestinal mucosa tTG has been considered to be an early marker for gluten-induced pathology in CD patients. It was observed that intestinal IgA-tTG deposits can be detected in latent CD patients in whom the mucosal villous architecture is still intact, and that the intensity of these mucosal deposits decreased after adherence to a GFD and increased after gluten consumption. Although numbers were low, mucosal IgA-tTG deposits increased in four patients on placebo and one on AN-PEP and decreased in one patient on AN-PEP, compared to baseline values, suggesting that AN-PEP may mitigate gluten exposure. Some gastrointestinal-related symptoms, mostly mild and transient, were reported during gluten challenge and symptoms between the two groups were comparable suggesting no treatment-related effects on gastrointestinal symptoms. Besides the substantial gluten intake, emotional stress as a consequence of having to ingest gluten might have triggered some of the reported gastrointestinal complaints. The celiac patients consumed approximately 7 g of gluten daily, which is about half of the average adult daily gluten intake in The Netherlands. Despite this high gluten dose, no substantial histological, serological, or symptom changes were observed with placebo after 2 wk. In another study in which adult CD patients consumed approximately 3.5 g/d of gluten from cracker biscuits for 2 wk, only few patients consuming gluten on placebo showed deterioration on histology, serology, and symptoms. Two other studies investigating a gluten challenge in adult patients, based on either lower gluten intake (2.5-5.0 g/d for at least 3 mo) or comparable gluten intake (4 slices of white bread daily; approximately 8 g/d) showed that a moderate gluten intake can be tolerated by some patients for several weeks-to-months without significant changes in symptoms, serology and histology[26,27]. The time to serological and mucosal relapse and recovery after gluten re-introduction and elimination, respectively, can be highly variable among adult CD patients from several weeks up to many years[27-30]. Excluding 2 out of 16 patients that may have been more sensitive to gluten from the efficacy phase may, to a small extent, have caused sample bias by selecting patients being less sensitive to gluten. Nevertheless, the same population of patients that entered the efficacy phase was randomly allocated to the AN-PEP or placebo arm. Also attrition bias can be excluded since all patients remained in the study. The lack of substantial clinical response to gluten observed in this study indicates that a longer gluten challenge is likely necessary to induce a significant clinical response to gluten in the majority of patients. For the same reason a longer wash-out period should be considered. Moreover, unresponsiveness to gluten of patients being diagnosed for more than 10 years ago, suggests that future studies may benefit from selecting more recently diagnosed patients. In conclusion, AN-PEP appeared to be safe in celiac patients. More patients and gluten challenge for a longer period of time seem to be required to induce significant clinical changes and to confirm whether the tendency of AN-PEP to reduce small bowel IgA-tTG deposits is of clinical significance. These results together with previous in vitro evidence that AN-PEP efficiently degrades gluten under simulated gastrointestinal conditions warrant confirmation in a larger trial. The authors wish to acknowledge Dr. C Gerhardt (DSM Biotechnology Centre) for critical reading of the manuscript. The only currently available treatment for celiac disease consists of life-long dietary exclusion of gluten, perceived as a substantial burden particularly due to high costs, dietary restriction, reduced social activity, and increased health worries. Alternative treatment modalities that reduce the need of dieting focus on modification of dietary components, enzymatic degradation of gluten, inhibition of intestinal permeability and modulation of the immune response. Following this, a previous report showed that the gluten-degrading Aspergillus niger-derived prolyl endoprotease (AN-PEP) degraded toxic gluten proteins in a food matrix into non-immunogenic gluten fragments in an in vitro digestion model that simulates the human gastrointestinal tract. This is the first randomised double-blind placebo-controlled pilot-study evaluating the safety and efficacy of AN-PEP in celiac disease. The celiac disease quality of life scores remained relatively high during 2 wk consumption of gluten and AN-PEP indicating that patients’ general well-being remained high. The enzyme AN-PEP might possibly assist in digesting unintentionally ingested amounts of gluten in those who cannot tolerate gluten. However, the primary aim of the study was not met as the placebo arm did not show any deterioration (small intestinal mucosa, celiac disease associated antibodies, and quality of life) after 2 wk of gluten consumption. Although numbers were low, mucosal IgA-tTG deposits increased in 4 patients on placebo and one on AN-PEP and decreased in one patient on AN-PEP, compared to baseline values, suggesting that AN-PEP may mitigate gluten exposure. The lack of substantial clinical response to gluten observed in this study indicates that more patients and gluten challenge for a longer period of time seem to be required to induce significant clinical changes and to confirm whether the tendency of AN-PEP to reduce small bowel IgA-tTG deposits is of clinical significance. These results together with previous in vitro evidence that AN-PEP efficiently degrades gluten under simulated gastrointestinal conditions warrant confirmation in a larger trial. The aim of the present study was to examine the safety and efficacy of AN-PEP to reduce the clinical response to gluten in patients with coeliac disease. The safety study showed that AN-PEP was safe and well tolerated by patients with celiac disease. Data on time to serological and mucosal relapse and recovery after gluten re-introduction and elimination show highly variable results, varying from several weeks up to many years. Even though the primary endpoint was not met, this study is of interest and warrant support for such an approach.